Month 6 marks my entry into the 3rd trimester (2 down, 1 to go!) 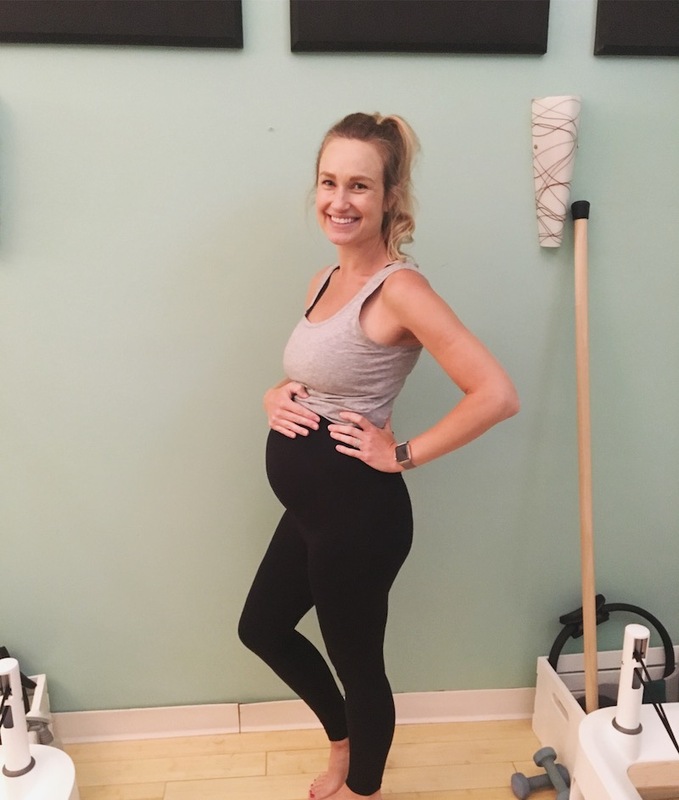 and my body is still feeling good – even if my mind is going a mile a minute (there’s still so much left to do before baby girl arrives!). My husband and I are still in the middle of a first floor renovation, so it’s a bit of a challenge to focus on getting the nursery ready when your main level is torn apart and you still have no kitchen! But we are surviving and the project should be done in a few short weeks – yay! Beyond getting the house ready, we have started taking all of the obligatory baby classes. So far we’ve completed Breastfeeding 101. It’s funny to think that you have to take a class for something that should be so natural, but we actually learned quite a bit and I would recommend this class (or something similar) to all first time moms and dads. I’m still walking between 4 and 6 miles about 4 to 5 times a week and doing prenatal Pilates once a week. I’m happy to report that my body is still feeling pretty great; although I have to be more careful about staying hydrated and fueled properly on my long walks to avoid cramping (contractions) or lightheadedness. I’ve ended up in a couple of situations where I was by myself, far from home and experienced some bad cramping and lightheadedness. Everything turned out to be fine, but it was a wakeup call that my body is in need of more water and fuel than it was even a few weeks ago! As I mentioned in my month 5 blog, I’ve been struggling quite a bit with RLS (restless leg syndrome), which I suspected was due to an iron deficiency. This suspicion was confirmed when the results from my 28-week bloodwork came back. Turns out I’m clear for gestational diabetes (thank goodness), but am slightly anemic (ugh). My doc doesn’t want me to take an additional iron supplement, but does want me to eat more iron rich foods (I thought I was already doing that??!!). So in addition to eating even more iron rich food (bring on the steaks), I’ve also switched back to my fancy “Baby and Me” prenatal vitamin (instead of the free prescribed form). And I’m happy to report that since switching back, my RLS symptoms have almost totally subsided. The nutrients in the “Baby and Me” vitamin are supposed to be much easier to digest than most other prenatal vitamins…and I am definitely a believer now! Beyond iron, the nutrient focus for the 3rd trimester is giving the baby DHA or “brain food”. So I’ve been focusing a lot on foods rich in DHA such as, salmon, enriched eggs and organic milk from grass fed cows. Just trying to do the best I can with no kitchen! !